Algiz is the half-month stave through 13 February. Fehu is the intuitive stave, and Laguz reversed indicates the Futhark’s message to us. Read right to left is Algiz, Fehu, then Laguz reversed. This winter we’ve come through entry into the second aett with lessons in getting coping skills (Hagalaz), identifying our needs (Nauthiz), then setting boundaries regarding them (Isa). With that new information, we did inventory (Jera), made some hard choices (Eihwaz), then with all of that information leapt into the void (Perthro). Now we stand our ground. Algiz is the rune of protection. Its varied cultural roots bring to mind visuals of elk and sedge grasses, both evocative of indigenous Nature Spirits, which bring powerful protection. There is an aspect of Algiz that hints at shapeshifting, which in the context of the Nature aspects suggests that when we come into deeply connected direct relationship (animism) with the Nature Spirits of our area/region, we become capable of taking those relationships with us anywhere, such that we can shapeshift into those beings. Such an ability would be the most powerful protection we can possess. Fehu suggests taking an active stance in how we engage Algiz would be deeply beneficial this week. That may merely bode well as a good, profitable omen, that our animistic community connections are strong, continue to tend them as-is. It may literally mean investing in our relationship to Algiz, to our Nature Spirits, to soothing any tensions therein. Look for classes or mentoring on how to show up more in those relationships. This is a good time to make such investments in education, knowledge, and animistic relationships. That investment may also look like devoting more time and energy to these relationships, and clarifying any commitments or agreements within them. Laguz reversed is where the real commentary on this week’s cast lays, and comes from the voice of the Futhark. 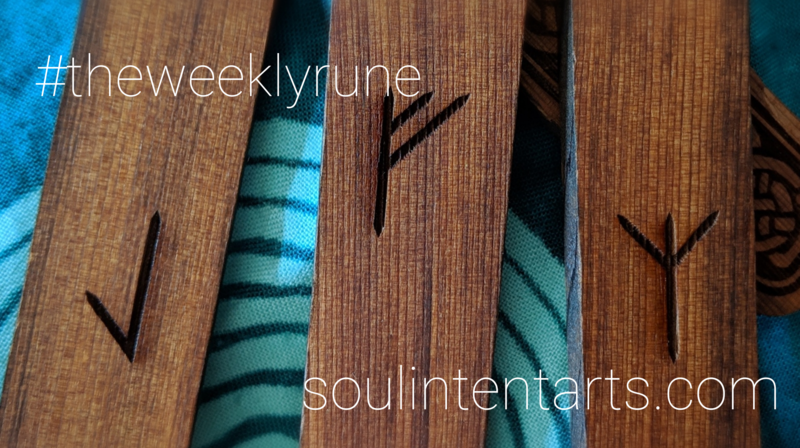 Upright, this rune is about not just flowing well with All Things, but being elementally aligned inside and out. 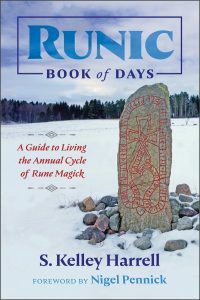 Where Wunjo is the rune of things coming together in a manifestation way, Laguz brings that same spirit to the internal and external being in balance. This is most often represented in our emotions, which are attributed to water. The emotional connection isn’t a historic affinity with Laguz; rather, it’s a more modern one. Nonetheless, many respond to all things water within that cosmology, now. The question to ask ourselves this week is “Where are we held back by our beliefs?” I don’t mean self-sabotage of personal origin, but experiences in which we have bought into the the bigger systems that hold us back. We may not have even realized just how much they are holding us back. When we begin to situate into our local animistic community–into Algiz–we lose the blinders for how domesticated we are, and what we’ve lost (and Nature has lost) as a result. There are perfectly fabulous Nature Spirits relationships to be had, which generates significant protection for all involved.